we are all ages. bring your valid drivers license. Sign up for info on events happening at BLAH, T!T! and P66. AUTOMATIC BREWING Co is a 10bbl brewery the was founded in 2010 and is was the first small beer manufacturer in the uptown area. 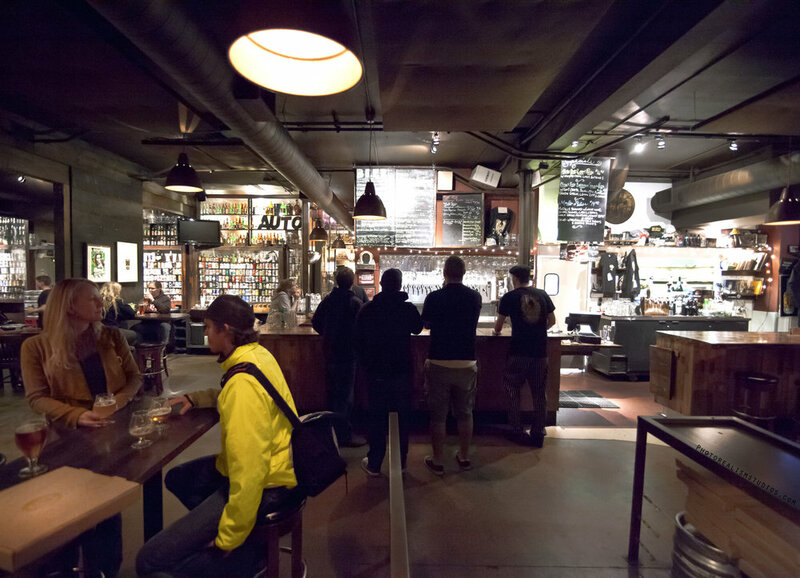 Automatic is located deep deep deep within Blind Lady Ale House in Normal Heights and headed by master brewer Lee Chase. Our beers are available almost exclusively at our home base of Blind Lady Ale House, as well as at our other spots Tiger!Tiger! Tavern (North Park) and Panama 66 (Balboa Park at the San Diego Museum of Art). We are gonna try something new: PASTA NIGHT! Chef Tommy makes delicious pasta from scratch and we decided it is high time you all get to taste it on the regular. So every Thursday we will feature a different house-made pasta. As the grassroots arm of the women’s movement, the National Organization for Women is dedicated to its multi-issue and multi-strategy approach to women’s rights. NOW is the largest organization of feminist activists in the United States, with hundreds of thousands of contributing members and more than 500 local and campus affiliates in all 50 states and the District of Columbia. Every Monday we celebrate Meatless Monday by highlighting our meatless pizzas and ramping up our meatless specials. In this video documentary we find Lee Chase brewing his first batch of Chocolate Rain at his new venture, the Blind Lady Ale House in San Diego. Lee has been knee deep in the glorious Southern California craft beer scene since its inception. Join us on the ride as we follow Mr. Chase walk away from a dream job to follow his own path to happiness. It's been a looooooong 10 months of construction on the building and we are excited AF that we can finally see the light. We can literally finally see the light through our windows again. Come check it out and be reminded why this is such a special building and amazing space to do business in. In case you didn't know, Tommy was our original Sous Chef when we opened 9 years ago, and we're so happy to have him back as Executive Chef 9 long years later. He's helped to bring the kitchen back to it's roots and we couldn't be happier. or PICK UP A COPY AT BLAH, TIGER!TIGER! or all over SD. WE RUN A SEASONAL KITCHEN AND, AS WE ALL KNOW, SEASONS CHANGE. We run a seasonal kitchen and have new pizzas constantly rotating on the specials board. House-Made Chorizo, Poblano Chile, Fontina, Epazote, Cotija Cheese, Tomato Sauce. ADD Avocado when available. House-Made Soyrizo, Poblano Chile, Fontina, Epazote, Cotija Cheese, Tomato Sauce. ADD Avocado when available. Over the past 9 years we've been working hard to be the best beer bar we can be. It's nice to see people appreciate all the hard work! San Diego is an oasis for beer lovers, and nothing goes better with a pint than a slice. Blind Lady excels at both. One of their founders has a degree in brewing science, another is certified by the Associazione Vera Pizza Napoletana, and the third, well, he's an artist who did an album cover for Blink-182 and Jack Johnson. 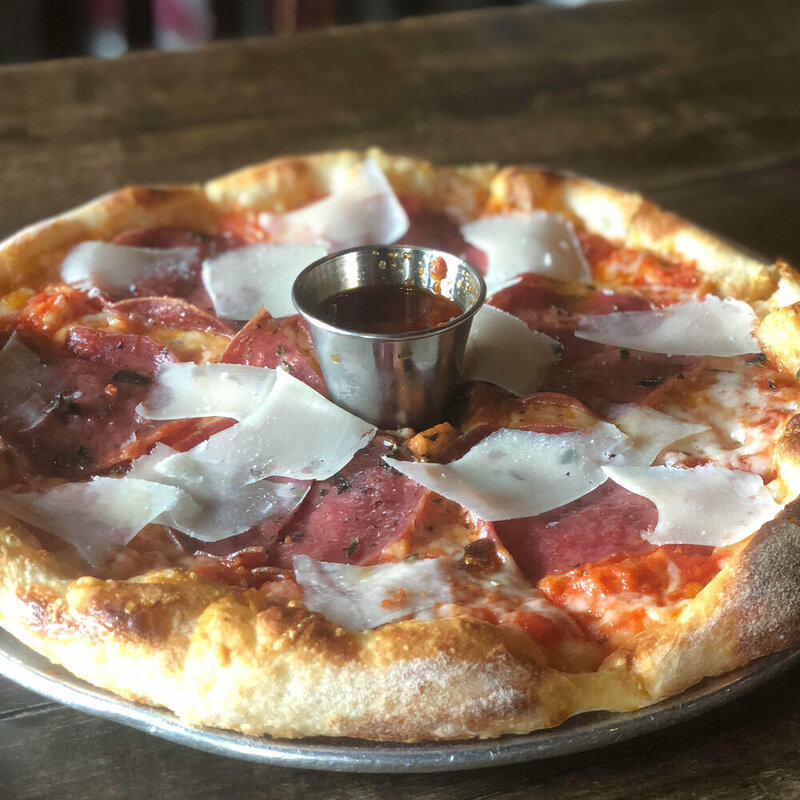 Since they are a brew-pub, there must be bar snacks (Belgian frites, spicy beer nuts), but the pizza is king, from the classic margherita to more experimental options like the house chorizo with poblano chiles, fontina, epazote, and cotija (soyrizo swaps available upon request). We're honored to have been named to the Draft Magazine "100 Best Beer Bars" list every year we've been open. We'd like to think this is due to our strict line cleaning program and our true love for all things beer. yep, we won again for 2018! Lee Chase graduated from UC Davis with a degree in Malting and Brewing Science and soon after passed the prestigious Institute of Brewing Associate Membership Exam to become a Master Brewer. Lee went on to work with three breweries and a yeast lab before committing to what was then a start-up operation called Stone Brewing Company. Over the nine+ years that Lee was with Stone, they grew from a small time brewery to an internationally-recognized icon of craft brewing. He currently works with numerous Breweries in the USA, as well as Canada, Costa Rica, India, Australia, Africa, and Norway. Currently Lee is a staff-of-one running Automatic Brewing Co in the back of BLAH. It's all about the food. And ours is, we think, notable for many reasons. We respect beer at the Blind Lady Ale House. And we’re a little fanatical about quality. This obsession is certainly exemplified in our beer—from the brewery to your glass, we do everything we can to ensure the beer tastes as the brewer intended. The Art of Organoleptic-Enhancment Engineering. 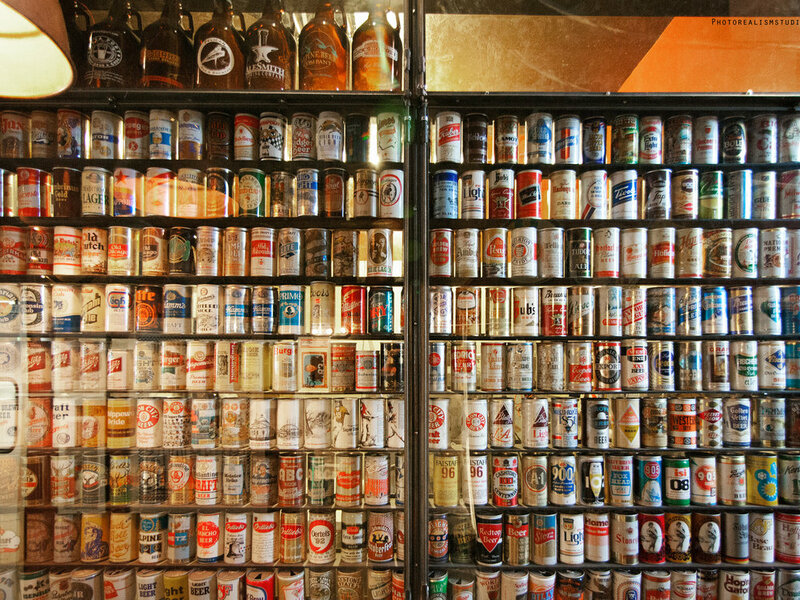 Draft beer takes center stage at the Blind Lady Ale House. We’ve designed and built a unique system that incorporates a multitude of specialized components to ensure that your drinking experience is the very best it can be. Our All Stainless Steel Metal Components. Save for the lines, everything else, from the keg to the faucet, is in fact made from stainless steel. This includes the coupler (the device that connects to the keg), the tail-pieces (the barbed pieces that connect the beer-line), the shank (the part that goes through the wall), and the faucet. In the processing of beer at a brewery, only stainless steel is used. However, most bars use nickel-plated brass—an odd choice indeed, because it reacts horribly with the beer. But the thing is, it’s cheap. A brewer would never use a brass component in the brewery, so why should we in our bar? And you know what—our beer tastes fresher. Many of you have noticed that we rinse the glass just before we fill it with your beer. And many of you have asked, “Why?” The Health Department requires a final rinse of sanitizer before air-drying. This is great for sanitation, but not so good for beer flavor— you’re left with sanitizer residue in your beer! So we rinse your glass with water that has been carbon filtered to neutralize any foul odors or tastes. The Art of Appropriate Glassware. A lot of thought has gone into the choices we’ve made regarding our glassware. Each glass is craft-beer appropriate, with it's own set of organoleptic-enhancing features. All of our standard glasses have a pour-line, which ensures that you are getting what you pay for. The serving-sizes are listed on the chalkboard menu, right there next to the %ABV and the price. We were in fact the first Certified Honest Pint establishment in Southern California. No cheater-pints here. We selected glasses that are larger than our pour, which allows room for foam on top of the beer. The foam not only looks beautiful, it also enhances the experience by releasing the drink’s aroma—and the majority of flavor is aroma. Lasting foam is considered a positive attribute to a beer: it reflects a clean glass and beer-line, as well as the Brewers’ skill during the process, and their ability to preserve subtle flavors in the beer. Cold beer is refreshing! But even a standard 16-ounce pint glass often leaves the last sip of beer warm. Our larger glass, the 21.5 ounce Willy, is engineered to keep beer cool until the last drop—it features a large, solid mass of glass that acts a little like a non-melting ice-cube. Our Snifter is used for stronger, more complex beers that aren’t served quite as cold. It is engineered to fit nicely in the palm of your hand, which allows you to bring the temperature of the beer up. The Belgians are probably the most celebrated for their beer-specific glass shapes, which are not just about function, but often express an artistic form. There is a sculptural element to the glass, and the various shapes can add to the landscape of the table. Our array of glassware is not just enjoyable to drink from, but also to view and to hold. We are giving 10% of all sales (beer, food, merch, the whole shebang) from Sunday, February 10th, to Animeals. Sign up for info about events happening at BLAH, T!T! & P66. •TABLES: MULTIPLE LARGE TABLES AVAILABLE FOR RESERVATIONS. •TIMES: RESERVATION START TIME MUST BE BEFORE 6PM AND END BY 8PM. TABLE(S) WILL BE HELD 15 MINS PAST START. AFTER 15 MINS TABLES WILL BE BACK UP FOR GRABS.. RESERVATIONS END AT 8PM. AT THIS TIME TABLES MUST BE CLEARED IF CUSTOMERS ARE WAITING. You can use this form for general inquiries. If you're looking to make a reservation, read the info above.